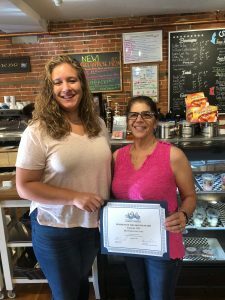 Angela Pecorelli opened her coffee shop in the center of Bradford a little over a year ago and it is already a town staple. Serving everything from coffee and muffins, to a full breakfast and lunch menu. Angie is constantly testing new items such as “candied bacon” and pushing the limits of food items. Not only does she serve delicious food in her café, she also does delicious catering. Angie has not only supported the Chamber but she also supports the community. The day after the explosions in our neighboring towns she offered everyone affected a free hot breakfast. From L to R – Hillary Rogers, Membership and Marketing Manager at the Greater Haverhill Chamber of Commerce and Angela Piecorelli owner of Bradford Place Café.